"life gets better from here"
United Resource's retirement communities offer seniors an opportunity to remain independent, with the added benefit of assistance, when needed, always nearby. "Our communities are a place to call home, a place to socialize and meet new friends, a place to enjoy independence in the autumn of life, and a place to live life to the fullest. That's why we offer a broad range of options that will help all our residents enjoy their life on their own terms." 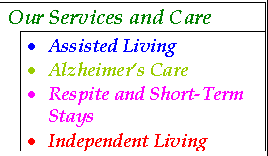 We offer caring personal assistance, supportive services and concerned care in a professionally managed, carefully designed community setting.